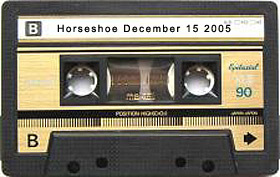 Details: The Rheostatics, live at the Legendary Horseshoe Tavern in Toronto, December 15, 2005 - Guest Vocalist Night. Ford Pier on keyboards. This was the 8th show of their 10 night Fall Nationals run at the Horseshoe. 8 track files provided by Steve Clarkson - mixed by Darrin Cappe with a bit of track specific compression, gain, limiting and slight reverb to drum and vocal tracks. 10 Years later I randomly met Robin Lowe on Sept 4th, sold Jennifer Foster my spare ticket for the Saturday night AGO show on Sept 5 2015, and Selina sang with the band on Sept 6 at the Monarch Tavern after AGO Party.